Your first thought on seeing this weird pink snow might be an industrial accident or a nearby Big Foot massacre. Rest assured, it’s neither—just a perfectly natural, snow-dwelling algae. So, why are scientists all in a tizzy about it? Because it’s causing glaciers to melt faster. That’s the startling conclusion of a study just published in Nature Communications that which suggests we may have seriously underestimated the ability of tiny red algae to screw with Earth’s ice caps. And their so-called “bio-albedo” feedback is only expected to grow as the planet warms up. Red snow algae have been described all over the world in polar and alpine settings from Greenland and Antarctica to Iceland and the European Alps. In the winter, they lie dormant in the snow as spores. But in the late spring and summer, when their icy habitat begins to melt, they blossom to produce striking pink landscapes. 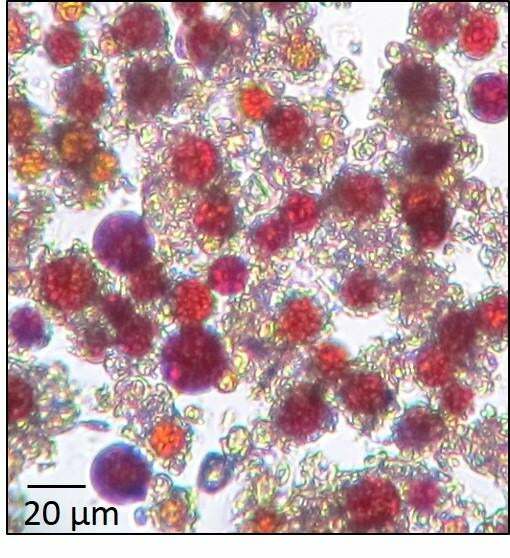 Now, a sweeping analysis of red snow algae across 21 glaciers in the pan-European Arctic shows that these tiny critters are actually helping the snow melt faster. The reason has to do with a simple climate-altering process known as the albedo effect. You’ve probably heard about how glaciers keep our planet cool by reflecting sunlight. As glaciers melt, they give way to darker land or ocean surfaces—surfaces with a lower albedo. This causes the Earth to absorb more sunlight and heat up even more. Turns out, red snow algae have a non-trivial effect on the albedo of the snowy surfaces they colonise, reducing it by as much as 13 percent, according to the new study. And while it’s still unclear just how large these blooms can get, lead study author Steffi Lutz of the University of Leeds says they can be quite widespread in the Arctic by summertime. This makes red snow algae an unaccounted mechanism in the long list of reasons the Arctic is melting like an ice lolly in a microwave. Lutz and his colleagues are now working to estimate how much glacial melt red snow algae are actually responsible for. They’re also hoping to incorporate the colourful critters into future global climate models. What’s worrisome is that even if red snow algae have a small influence on Arctic ice cover today, their role is likely to grow as human carbon emissions warm the planet.